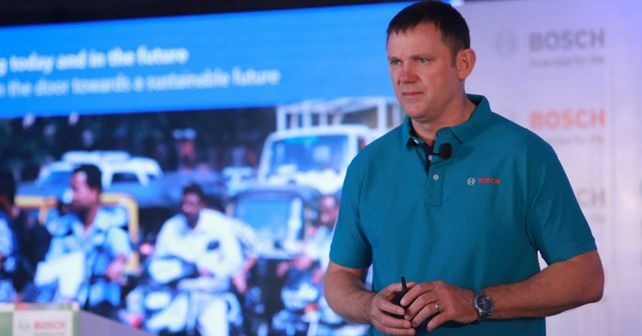 According to Bosch, how will the new crash testing and emissions norms help the Indian market become safer and more environmentally-friendly? I think that the Indian government is being very progressive in terms of technology and are pushing towards what they believe is the correct thing from the end-user perspective. I'm not a big believer in legislation, I'm rather a big believer in having a target and achieving that target. However, if legislation is necessary to achieve one of those targets, then I think it's the correct step. The two targets that the government have in front of them are to reduce emissions and also increase road safety, which I really can't disagree with as they are the correct targets. Also, the fact that they have been quite aggressive over the past few years in order to move towards those targets is also necessary as your market is big, and it is only becoming bigger with each passing day. But, the same can't be said about it becoming safer. If you don't change anything, then you can't expect changes to happen on their own. So, the fact that the Indian government is pushing to make that change is indeed a positive step forward. Over the next five years in India, what level of penetration can we expect for something like the ABS technology in two-wheelers? Well, I believe the 125cc and above bikes are maybe getting close to about 25 per cent of your total market size. So, due to legislation, you have at least a quarter of your market with ABS. The interesting topic here is what's going to happen after that. As we just discussed before, and in my opinion, one of the problems surrounding ABS technology is that not everyone understands what it really does. But, if you have 25 per cent of your market already using the technology, then it's just a matter of time that the remaining market also gets educated about what ABS can do. I believe that once this awareness penetrates, you'll see additional ABS penetration even below the legislation limits due to a market 'pull' rather than because of a legislative mandate. However, putting a time frame on how quickly will this happen is difficult for me. Some end-users would want this to happen relatively soon, especially those who are seeing the introduction of ABS on larger capacity bikes. Therefore, some of the younger generations might just say that they're interested in having a bike with ABS. They might still be in the 125cc category instead of the larger bikes, so ABS can be one option for such people. Some OEM's out there are running two different models, let's say their 150cc and 125cc models, off the same platforms. So, for such OEM's, it will be easy to introduce ABS from the 150cc bike onto the smaller 125cc bike. So, I see this as one way of testing ABS outside of the legislation limits. I'm sure the penetration will increase but at this point, I do not have a time frame for it in mind, or how quickly will it occur. Do you see your new radar-based systems in two-wheelers picking up the pace in price-sensitive markets like India? If I look at the Indian market even from five years ago till today, the segmentation is changing and you are getting a lot of higher-capacity bikes into your market. So, do I expect the technology to come into your market? Yes, certainly, since quite a lot of European OEMs are selling their products in India and thus, some customers are buying that technology. However, from a cost perspective, the radar-based technology isn't really of much use if you have a million people sitting at an arm's length from each other. In this scenario, you really don't need a radar to tell you where you are. But for touring situations, the radar-based technology is very convenient and helpful. So, the real question here is how quickly will the touring segment grow in India. I've been lucky to ride here, outside of the city, quite a few times and it is really amazing to see just how many people actually go for rides on the weekend for fun. It has really stepped up, especially in the past four-five years. So, as long as you have this segment of riders, there is always scope to bring this kind of technology since it is really beneficial. In my opinion, the cost will be the only hindrance but in some segments, I do see a lot of scope and potential for this technology to get through. There's been a lot of talk around a significant rise in the cost of small diesel cars in India post the BS-VI norms. What are your views about that? Is that going to affect small diesel car volumes in a big way? Well, my expertise is really not into this area, maybe Prabhu (Head of Two-Wheeler and Powersports Business Unit, Bosch India) will be able to answer you better on this one. Since I'm responsible only for the two-wheeler segment, I have no background on the diesel industry as such. However, to take a parallel question on the two-wheeler segment, of course, there is going to be a cost increase in the Engine Management Systems for motorcycles, which is never really nice for the end-user. But, on the other hand, pollution is also not nice! So, striking a balance between both these aspects is a tough challenge indeed. Once you have made the step towards a Fuel-Injected (FI) system, most of the cost increase is there and therefore, you can get more and more benefits from it. So, in the direct jump from there to BS-VI, the additional cost isn't much and therefore, in my opinion, extracting the most out of the FI technology (BS-IV) and then jumping on to BS-VI directly seems to be a clever move. This creates room for reaping maximum benefits within a single step, rather than first going to BS-V and then investing more to achieve the BS-VI norms.